Paul Lewis is Vice President of Policy and Finance at the Eno Center for Transportation. In that capacity, he directs Eno’s policy research programs, including paper development and event organization. 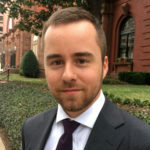 Lewis has led policy projects related to federal policy, transportation planning, and transportation governance, including Eno’s Transportation Finance, Freight, and Aviation Working Groups. Lewis has also led research on emerging mobility and automated vehicles. He received his B.S. in Civil Engineering from Ohio Northern University and his M.S. Transportation from the Massachusetts Institute of Technology. Paul Lewis, VP of Policy for Eno, talks about the policy certainty provided by the five-year FAA reauthorization just passed by Congress and the prospects for ATC reform after it wasn't included in the legislation.